John McQuarrie's love of guitars began at an early age. When he was 6 years old, he fabricated a makeshift guitar using a tissue box, paper towel roll and a bath tissue roll as the components. Seeing this, his parents decided to buy him his first real guitar and a series of lessons. Over the next few years he continued playing guitar and eventually began studying classical guitar with the Royal Conservatory of Music. Once in high school, John excelled in woodshop class. When prompted to submit ideas for a personal project, John chose to build a guitar! His teacher, Dan Zaklan, was skeptical, but warmed to the idea when the plans were drawn up and presented the next day. With the help of his teacher and several books on the subject, that first guitar was successfully completed. John continued building and repairing instruments throughout his high school years and was fortunate to be hired by Jean Larrivee in the 1980's. This employment was invaluable as the Larrivee factory was building both electric and acoustic guitars at the time. He remained at the Larrivee factory for 7 years. During this time, he continued with his repair business and began collecting the tools and machinery needed to branch out on his own. 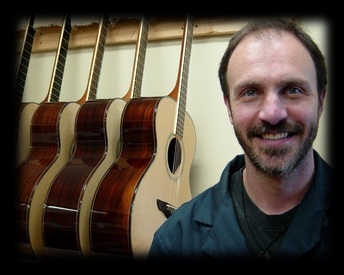 After leaving the Larrivee factory in 1994, John started Northwood Guitars in Langley, B.C. He continued building and repairing guitars and other stringed instruments and began attending trade shows worldwide to promote his product. He now has a loyal dealer network in locations around the world. In 2006, John and his now growing family moved from Langley, B.C. to the small hamlet of Sorrento, in the British Columbia interior. As well as building Northwood guitars, John repairs a wide range of stringed instruments including mandolin, banjo, bass and of course guitar. He is also the on-site luthier at The Nimblefingers Bluegrass Festival held every August in Sorrento. Visitors are always welcome at the shop and need only call or email beforehand to set up a time for a visit. The Northwood guitar shop is located near beautiful Shuswap Lake, in the British Columbia interior.